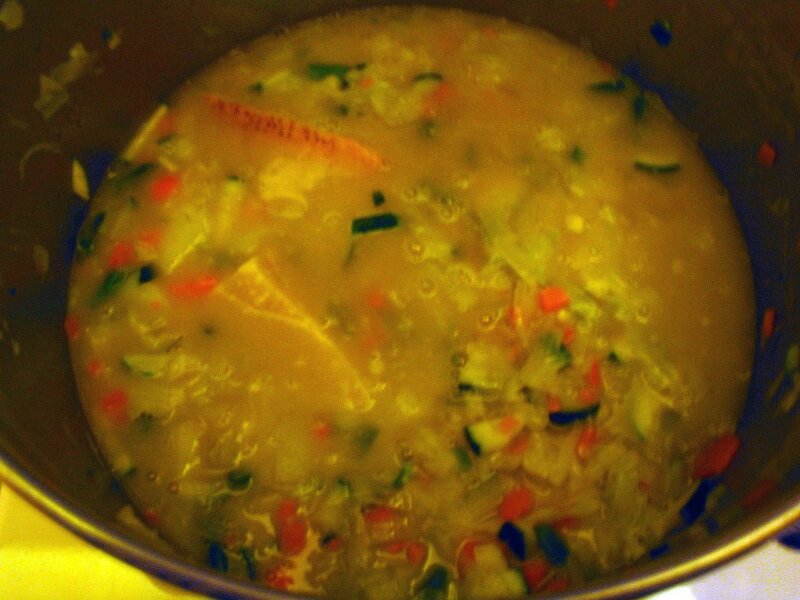 It's Halloween and the ghosties and ghoulies will be out soon, so I came home early to make some soup to slurp between the rings at the doorbell and to bring some warmth to what it turning out to be a rather chilly and grey day. Perfect for trick-or-treaters, less so for the rest of us. I thought the wine to go with my hearty Nigella Lawson minestrone might be this 2003 Ca'Viola Dolcetto D'Alba Barturot ($24.69, Costco). This is slightly above my normal price cut-off, but I do love dolcetto, which translates roughly from the Italian as "little sweet one." A grown-up treat then, or so I tell myself, and far better for me than diving into the bowl of candy set aside for the ghosties and ghoulies. The Columbia Wine Guy over on Brim to the Dregs is working his way alphabetically through wine (great idea!) and he hit "D" just the other day and gave some great information on dolcetto, as well as a more budget-friendly recommendation than mine is tonight. On to the 2003 Ca'Viola Dolcetto d'Alba Barturot. Ca'Viola is in the Piedmonte region of Italy, and the oenologist, Giuseppe Caviola, has been dubbed the "King of Dolcetto" and received the 2002 Gambero Rosso Winemaker of the Year. This wine was made of 100% dolcetto d'alba grapes aged in stainless steel for 10-12 months. For those who have not tasted a red wine that has not had any oak aging, this is your chance. The first impression you get of this wine is purple--the color of dark aubergines. Once you pick it up and take a good look at it you see it is really a true ruby red with lovely bluish tones to it. I found this wine needed a fair bit of time to settle down and open up. When it was first opened and poured it smelled very alcoholic (14.5% alch./vol.). Even after it's been in the glass a while the aromas are spicy rather than fruity. This is confirmed on the palate, which is predominantly spicy with an undertone of red fruit. Lots of acidity and a tinge of minerality at the end of each sip. It was much better with the food than as a stand alone wine. I felt this wine needed a bit more fruit to balance out all those intriguing spice and mineral flavors, and that for the price this represented good QPR. If you are looking for a low-tannin, high-acid red with little oak influence that would go well with pasta with red sauces, it is for sale at many merchants throughout the US, and typically retails for under $30. I am the first to admit that I am not a huge chardonnay fan. I find many of them overblown, over-marketed, over-priced, and over-hyped--not to mention overly buttery and toasty. They can be so difficult to pair with food, and yet all over America people drink them by preference. Though not a card-carrying member of the ABC (Anything But Chardonnay) club, I do sometimes look askance at friends who enthuse over their latest boutique chardonnay find. 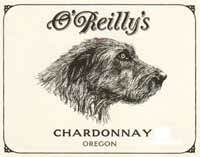 Tonight I joined the ranks and chilled down a 2004 O'Reilly's Chardonnay ($12.95, Chronicle Wine Cellar). This just might be the bottle that makes me a chardonnay believer. O'Reilly's is the budget-friendly line from one of my favorite Oregon winemaker's, Owen Roe. They proudly list the O'Reilly's wines before their better known Owen Roe bottlings and celebrate their great value--which I would certainly agree with. I love their higher-end bottlings (especially the Bordeaux-style blend Abbot's Table which usually is available somewhere between $20-$30). They focus on quality and I must say I've never had a disappointing bottle of wine made by them or by their neighbors at Sineann. The 2004 O'Reilly's is typical of all Owen Roe bottlings, in that they strive to achieve good varietal character and not monkey about too much in the processing of the grapes. For chardonnay, the varietal characteristics without processing should be fruits: apple, pear, citrus, pineapple, guava. It's processing that adds the oak, toast, vanilla, butter, cream and coconut--and in the wrong hands this can be a total disaster, with artificial oak and vanillin flavors the result. This wine, however, was made using early-ripening Dijon clones and 2/3 of the fruit was aged in stainless steel (to preserve the varietal characteristics), 1/3 in 3-4 year old American and French oak barrels (to add some interesting richness and depth to the wine). I had a glass while I was roasting some potatoes in the oven, grilling some salmon to top off with some Scandinavian dill-mustard sauce from the Joy of Cooking, and sauteeing some snap peas in lots of cracked pepper and a smidge of butter. It was pale straw in color, with some apple and citrus aromas. The taste was citrusy and smooth, with a nice long finish of vanilla and hints of tropical fruit like pineapple. At the very end of each sip you got just a bit of toast--nothing overwhelming or daunting. I kept reaching for the glass, over and over, amazed that such an inexpensive wine could have so many flavor dimensions. The wine was excellent with the fish, stood up to the mustard, and complemented the roast potates and buttery peas. This was a food-friendly chardonnay, with textbook chardonnay characteristics and excellent QPR. It would be just as good with roast or fried chicken, caesar salad, or crabcakes. Available at many on-line retailers on both coasts, it is a great example of a quality Oregon chardonnay and is well worth seeking out. We needed parmesan cheese and sponges--what an excuse to go to Costco! No one in their right mind would go to a Costco on a Saturday if they could possibly avoid it, so I set out today. Because the local Alhambra warehouse has an uninspiring wine section, I decided to go to the hipper nearby demographic of Los Feliz and check out their warehouse's selection. Final assessment: it was better, but probably not worth the trip. I was clearly spoiled by 7 years of shopping at Costcos in Sonoma and Napa. Even so, I came home with a great buy on white burgundy, inspired by Brooklynguy's recent wine tasting event experience: the 2002 La Chablisienne 1er Cru Grand Cuvee ($16.99) which is just becoming drinkable. I'm going to hold on to it for a while, though, just to remind myself that you have to buy wine like this whenever and wherever you find it. When it peaks in 5 years it will be very expensive if you can get your hands on it at all. I also purchased another bottle of the 2004 Bodega Norton Malbec Reserva ($12.99), another great buy on a great value red. I took a flyer on the 2003 Ferrari-Carano Siena ($16.69), a Sangiovese blend from the Alexander Valley. Don't know this wine, although I love Ferrari-Carano's Fume Blanc which has been an excellent wine for the money over the past few vintages. I've never had one of their reds, and with fall coming (slowly to be sure in LA) there is certain to be pasta in my future. Perhaps the best bargains of all, however, came not in wine but in wine accessories and books. I picked up the new edition of Jancis Robinson's The Oxford Companion to Wine ($39.99). This is a huge encyclopedia of wine lore, nicely presented and surprisingly easy to read for a reference work. I will have to do a better review of it in an upcoming post, but Costco shoppers might want to be on the alert for it at their local branch as this is a pretty hefty savings off the retail. I also picked up some of those neoprene bottle holders by Built NY, which were tucked back next to the endpacks in the wine section. Good for toting wine to picnics because they both insulate and protect (the stuff is wetsuit material), they came in sets of 2/2 bottle and 3/1 bottle for $16.99 a set. Lots of folks are getting these at the holidays given the price! Last night I cooked Keralan food from South India using Maya Kaimal's excellent Curried Favors. I wasn't able to find any of the recipes I used online, but if you want to check out Maya's accessible approach to Indian food, you can go to the Rachael Ray magazine website (she's everywhere!) and see her recipe for curried chicken. We had lots of fun with our belated Diwali festival (missed it by a few days! ), eating shrimp thiyal and cabbage thoren with some eggplant curry and lamb korma. But the menu did pose problems for someone like me who prefers wine to beer. I know that beer is supposedly best. I was told this by the guys at Chronicle Wine Cellar, who tried to persuade me not to buy wine that day. But I think gewurztraminer and rieslings do work well with curries, so I asked the Chronicle Wine staff for a recommendation and they suggested I try either the 2003 Chateau d'Orschwihr Gewurztraminer Bollenberg ($14.95) or the NV Cavit Prosecco Lunetta ($7.95). I bought both, to try out a little experiment. We opened both before dinner, and I had sips of both before eating. I was extremely impressed by the NV Cavit Prosecco Lunetta, which I think had excellent QPR. It was fresh and round on the palate, and the nicely bubbling glass was pleasantly refreshing. It was toasty and a bit yeasty, with I found a nice counterpoint to the typical lemony essence of prosecco. Sometimes a prosecco at this price point can be a bit harsh and acidic, but not this one. With the food it stood up to the strong flavors without overwhelming them, and while I've never had a sparkling wine with Indian food after this I have to say that prosecco was a great recommendation. I wouldn't necessarily pull out your finest French vintage champagne, but the prosecco was very good indeed. This Lunetta would be an excellent holiday pour, good with a variety of foods and extremely affordable. Striking label, too. Thanksgiving? On to the 2003 Chateau d'Orschwihr Gewurztraminer Bollenberg, which I rank as having good QPR. (here's a label shot from an earlier vintage--but the label looks the same). I'm not as familiar with Alsatian Gewurztraminer, which is less dry than new world bottlings. It was deep and golden in the glass, and had really interesting honey, peach, and apricot aromas. The first sip, without food, was over the top and sweet. This is definitely an off-dry wine. With the food however, espeically the highly seasoned cabbage and some spicy chutneys, this wine was very nice. But I did feel that it may be overwhelming the food, rather than complementing it. I found it interesting that the CWCellar staff felt that riesling was too lean and wouldn't stand up to the food as well as the gewurztraminer. So the jury is still out on Indian food and wine. I have yet to feel like I know the wine to go to--never mind the maker--when I'm thinking of cooking up a Keralan feast like this. Any readers with suggestions or recommendations, please leave a comment. It's hot in LA, and we're back to eating burgers and salads. Dragged home from the library and popped a 2004 Sollner Guner Veltliner Danubio ($9.95, Chronicle Wine Cellar) into the fridge while I made up some of Rachael Ray's chicken cacciatore burgers (not the one on the web--the one in 365 No Repeats that actually has a proper bun and sauteed portabella mushrooms) and of course a Jamie Oliver salad. People get sniffy about Rachael Ray, just like they do about Beverages & More, but she's the only woman in my kitchen almost as much as I am. Mind you, I can't stand watching her on tv, but I like the cookbooks. As the burgers were grilling and the peppers and mushrooms were sauteeing, I opened up the GV. I wasn't expecting much because I had this at someone's house after I bought my bottle and didn't think much of it. Mine tonight was nicely chilled down, and it was paired with food that had an edge of sweetness and earthiness to it and it was very good. Gruner Veltliner has an interesting varietal flavor profile: stones, minerals, grapefruit, white pepper, and lentils. How's that for a wine? If you haven't tasted it before, it tastes like a super lean riesling, with no impression of sweetness. It is experiencing quite a surge of interest at the moment, with wine writers like Jancis Robinson extolling its virtues and versatility. This GV, from Weingut Sollner on the Danube, is made at a certified biodynamic vineyard. What are biodynamics, you ask? I thought it was a super organic designation, and then I went to the Oz Farm dinner this summer outside Point Arena and discovered it was something else entirely. Based on the philosophy of Rudolf Steiner, biodynamic wine production (as far as this historian can tell) is based on medieval and early modern farming techniques. Wineanorak has a good article on the topic. It's very much a "plant this wine at the full moon" philosophy. NPR did a great show on the topic, and urged caution before we turn up our collective scientific noses at it. At Oz, they think it makes a difference and they're the farmers, so they should know. The 2004 Sollner GV Danubio was as pale as water in the glass, with a slight golden tint. Lots of citrus in the aromas and some on the palate. But mostly the taste was indeed stony, with a hint of musty lentilness and a bright peppery spark if you really dug for it. Some GV's just stun you with the way the flavors keep unfolding--rocks, fruit, herbs, lentils, spice--and this was not quite that fine. Still, I give this very good QPR for its price. It is available online at some east coast merchants, as are different vintages designations for Sollner. Last but not least, this is my first Thanksgiving wine recommendation. Because it goes best with food with a touch of earthy sweetness, it would be great with turkey, cranberry sauce, and any mushroom dishes. At this price, you can get a few extra bottles and put it away for the leftovers, too. Today's wine shopping theme was: thinking ahead. I was prompted by the prospect of dinners with friends over the next few weeks (need wine to take to my generous hosts and hostesses, as well as wine in multiple bottles to serve at a Keralan fall feast I'm cooking on Thursday), the impending Turkey Day holiday, and by the challenge of the next Wine Blogging Wednesday to get out there and do some pre-planning that didn't involve simply thinking of what to drink with tonight's dinner. Kitchen Chick is hosting the WBW in early November, and the topic is ice wines--kind of a challenge for the under $20 bracket I focus on. I love dessert wines, though, and have never had an ice wine because they are usually way out of my wallet's comfort zone. 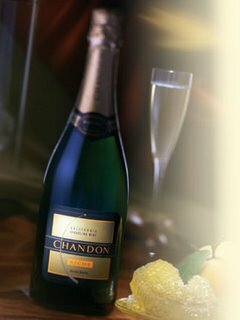 But I did some online research and discovered that my local Beverages & More had a bottle that wouldn't break the bank, as well as a nice special on Domaine Chandon Brut Reserve. So I got in the car and headed over to the Pasadena branch of the store. People can get quite sniffy about Beverages & More, which is (let's face it) a supermarket for wine. They even have a bar-coded loyalty card, just like the supermarkets. They seem to be everywhere in So Cal and like most chains, they can vary enormously in quality from branch to branch. The Pasadena branch is neither the worst nor the best I've shopped in, and I usually just go 2-3 times a year to buy sparkling wine and the odd French and Italian good buys you can find there. In general, their selection is more varied and more interesting than what you find at Ralph's or Albertson's, and their prices are competitive with the supermarkets. Though, if you hit a Pavilions with a good sale on, nothing beats their prices if they have the wines you want. But don't go to BevMo looking for advice. Sometimes you luck out and get a great clerk, but most often they know less than a serious wine drinker does about the options. They can help you find the sauternes, though! They are also quite good about posting shelf-talkers with magazine scores on them, which can be a help when wading through aisle after aisle of California Cabernets. Yes, yes, scores are no substitute for knowledge but who among us pays no attention to those insidious little 90 point proclamations?? Today's outing yielded a few finds: 2003 Ch. Lafaurie-Peyraguey Sauternes ($23.99/375ml and $44.99/750ml) which received huge ratings (97!) from all those wine magazines most of us read. Based on Cellar Tracker, folks are already drinking this wine which probably won't really even begin to live up to its potential until 2010. I bought a couple of bottles to put away for Christmas in 2010-2013. At $23.99 this really did qualify as a genuine bargain. I snapped up the last bottle of 2004 Jackson-Triggs Proprietor's Reserve Vidal Ice Wine for WBW ($21.99). And I bought three bottles of bubbly, all non-vintage: Nino Franco Prosecco Rustico ($16.99), Domaine Chandon Extra-Dry Riche ($13.99), and the Domaine Chandon Brut Reserve ($17.99 on sale). The sparklers will start flying off the shelves soon in anticipation of the holidays, so I wanted to start drinking around in my price range for some good options to buy and have on hand. Indian food demands Gewurztraminer in my opinion, and I found their selection less than inspired so headed back to Chronicle Wines to get all the remaining 2003 Hamel Pinot Noir I could get my hands on and see what they had in the gewurz department. I left with two bottles of 2003 Chateau d'Orschwihr Gewurztraminer from Alsace ($14.95) and will let you know how that goes down later this week. Last night we went out to a new Pasadena restaurant that touts itself as having great food, a wide selection of wines by the glass, pre-selected flights of wine, and on Thursdays, Fridays, and Saturdays starting at 9pm live blues and jazz: red white + bluezz. On Mondays, Tuesdays, and Wednesdays the sommelier offers "flight school," with topics ranging from how to navigate a wine list to tasting 101. We all thought the atmosphere was fantastic, with attentive and knowledgeable service. The hits of the evening culinarily speaking were a very unusual watermelon and Maytag blue salad with vanilla-lime glaze ($8), Kobe burger with fries ($18), and a fettucine primavera with hazelnut pesto (can't remember how much it was, honestly). We started dinner at 6:30 and the four of us were out of there at 8:30 after a leisurely, 3 course dinner. The music had already started at the bar around the corner, which has an open terrace area for smokers and a no-smoking policy inside. We had good seats, and drank some more wine and I tried their "Sophisticated Ladies" flight of red wines which included tasting-pours of the following for $12: A. M. Gille Cote de Nuits; Byron Pinot Noir; and Michael Picard Cote du Rhone. This was attractively priced and presented, with a great tasting sheet with three bright red dots on it. Each wine was positioned over its dot, and inside the dot were tasting cues to help you along. One quibble I had with both the tasting flights and the restaurant wine list is that no vintages where noted. I'm sure they would have told me had I asked, but it kind of detracted from the "we're serious about wine" message to wonder what vintage of Byron I was drinking. Of the three wines the Picard Cote du Rhone was the most interesting, and it was not one of their "wines by the glass selections" so I could not order more. The crowd was a nice mix of 20s, 30s, 40s, and up. It was particularly great to see a lot of 20-somethings out there with their dotted tasting sheets arguing about who smelled cedar in the flight while they ate Kobe burgers and listened to some pretty great music from Lil' Red's band. We would definitely go back, perhaps focusing on a flights and burgers in the bar like the 20-somethings. It's Indian Summer in southern California, with highs in the high 80s and cool, cool nights. Perfect for pinot! And to celebrate fall, we popped open a bottle of the best domestic pinot I've had in a very long time, the 2003 Hamel Pinot Noir Sonoma Coast. Technically, this wine comes from Campbell Ranch in Annapolis, CA, but if you are looking for it on Wine-Searcher (see sidebar) you will find it easily if you just leave it as "2003 Hamel Pinot Noir." I found it as several online retailers for under $30 (remember, I said mostly under $20) and at my beloved Chronicle Wine Cellar for $21.95. Steve Campbell’s family has lived on this property since 1938. Over the past few years, the Campbells watched as several growers planted Pinot Noir in the neighborhood. It had become evident to them and many others that this northwest corner of the Sonoma Coast shows great potential for producing exceptional Pinot Noir. In 2000, Steve, his wife Lisa and his father Phil followed suit. They identified a few choice acres of Goldridge soil on their large ranch and planted a nicely exposed ridge top that slopes gently to the north west. The site is about four miles from the Pacific Ocean and about 700 feet up above the fog line.Kevin’s grapes came from a swath through the center of the vineyard where the flavors showed the most promise. The clone is Dijon 777. This is a serious, and seriously good, Sonoma County pinot noir. The 2003 Hamel is dusky plum in the glass, and it has a delicious, silky texture as it rolls around in your mouth. There is a lot of spice and warm berries (raspberry, with strawberry and cherry) in the aromas and on the palate. The flavors just open up, one after the other, and there are hints of dark chocolate, vanilla, and tea as they do. At the end, there are still some strong tannins, which indicates to me that this wine may continue to improve in the bottle. Though this wine is still available, it is now 2 years since it's release in October 2004, and I think could still be interesting in 2 more years. I'm going to buy a half case and try out this theory! This has just excellent QPR--a wine that is worth every penny, even if you are spending more pennies than you are used to in the wine store. I like this just as much (maybe more?) than the Flowers pinot noirs, that are 2x the price when you can get your hands on them. It has great complexity, along with all the subtle pinot noir varietal characteristics. I'm not the only blogger to give Hamel high marks. See how Alder over at Vinography compared this wine to the field of California pinots at the June 2006 pinot tasting. Yesterday was a busy day of sight-seeing and showing the relatives around LA on the first day with real sunshine since they arrived. We were all exhausted and full after snacking our way through Beverly Hills and by the time we got home all we could muster enthusiasm for was soup, bread, and wine. But, hey, that's pretty good stuff! So I stuck out some bowls of olives and set out to make yummy Silver Palate Carrot Ginger Soup (you can cut the butter in half to diminish some of that wopping calorie count). For wine, I chose the 2006 Woop Woop Verdelho V ($8.95) which I purchased a few weeks ago at Chronicle Wine Cellar here in Pasadena. Mom and Dad drink the first bottle when they were out, and I hadn't tasted it yet, so I nabbed another. It is also available through retailers on both coasts (check Wine-Searcher, see link in sidebar). Verdelho wines are known for their crispness and their herbacious flavors--very much like a sauvignon blanc. Sometimes, also like Sauvignon Blanc, they are aged in oak. This wine was not, and it retained its bright, citrusy flavor profile. In the glass, the Woop Woop was very pale, almost clear. There was a nice whiff of grapefruit rind when you gave it a sniff. Where this wine really was pleasant was on the palate, where it managed to be both crisp and round thanks to a pink grapefruity flavor mixed with herbal and flowery notes. Woop Woop is part of Ben Riggs' Galvanized Wine Group,which includes popular labels like Penny's Hill and the Black Chook (my favorite shiraz-viognier blend!). They are based in the McLaren Vale wine region, and I think they make some of the best value wines around. For the price, and given its excellent varietal characteristics, I am giving this one very good QPR. If you like unoaked sauvignon blancs from California or Australia, you will like this wine and it will pair easily with all the foods you usually drink with your favorite sauvignon blancs. This afternoon we went out to see The Queen which we highly recommend and then over to the Heritage Wine Company in Old Town Pasadena for one of their weekend tastings. Heritage Wine is a great wine resource in the Los Angeles area, with a very knowledgeable staff and a great inventory, including hard-to-find German Rieslings, a nice selection of wines from Oregon, and a selection of Burgundies. You may not find many bargains here, but it is the place to go if you want excellent advice on special wine purchases. Each weekend they offer special themes tastings in addition to the regular flights you can purchase (such as great whites, or interesting reds). The one we went to focused on the wines of Piedmonte in Italy. Tastings like this are great because they offer budget wine drinkers like me a chance to sip wines we might otherwise never purchase or taste (like Barolo). None of us were that impressed with the whites, and the red that we liked best was the 2004 Castello di Nieve Dolcetto D'Alba, which I would give a rating of good QPR. It was a light bodied red wine, with a spicy, chocolatey taste. We felt it was a bit one-dimensional, and were not sure any additional ageing would improve this wine. This was in contrast to the Mauro Sebaste, which need another 2-4 years in a cool, dark place before the tannins balance out--not that any of us bought it to try the experiment! After several flight delays, the in-laws arrived and we settled down to a late dinner, preceded by this very good QPR sparkling wine from Domaine Chandon, purchased at Beverages & More back in early September for $12.99. (picture courtesy of Domaine Chandon). This sparkler is a blend of five varietals: pinot noir, chardonnay, muscat, pinot meunier, and pinot blanc. It has a fabulous color, like ripe cantaloupe melons, and there is a distinctive melon taste on the palate. "Style is determined by the maker. There is a Common Market Standard for levels of residual sugar (in parentheses) in sparking wines, but adherence is voluntary. Brut nature (.0-.5%) should taste bone dry. Brut (.5-1.5%) should taste dry with no perception of sweetness. Extra Dry (1.2-2.0%) tastes slightly sweet and is a style invented for the American market that "talks dry and drinks sweet." Sec (1.7-3.5%) literally translates to "dry", but is noticeably sweet. No wonder the public is confused! Demi-Sec (3.3-5.0%) is very sweet and Doux (over 5.0%) is extremely sweet." In this case, the extra-dry label is right on--"talks dry and drinks sweet." There is a sweet impression but the wine is really not sweet at all. It is perfect for appetizers, and would be great with spicy food or toasting over dessert. With the main course we had a 2001 Don Antonio Nero d'Avola--both over $20 and hard to find so no notes here, but I did leave one on Cellar Tracker! Because my sister-in-law and her husband are coming from New Jersey to stay with us for a week, I decided to go wine shopping. This is in spite of the fact that I know exactly which wines I'm going to serve with each meal I'm cooking all week already, and they are already in the house. Perhaps it's the anticipation of empty spots on the wine racks. We are looking forward to checking out some of the area wine bars while they are here, so stay tuned for reviews of those. For those of you who live in LA and haven't been to Chronicle Wine, you should consider a trip out to the east side. Go to the Huntington Library and Botanical Gardens (the weather is gorgeous and the fall plant sale is on this weekend), then to to Pie 'n' Burger, the legendary establishment where you can eat at chipped brown formica tables, chowing down on burgers with Thousand Island Dressing and iceberg lettuce that is folded into squares to fit the bun. (I know, but people do come from miles around). After you eat, head out of the store, turn left then left again down a kind of daunting alley, and under the apartments you will see a plain door with some Christmas lights around the door. Do not be alarmed--just go in. 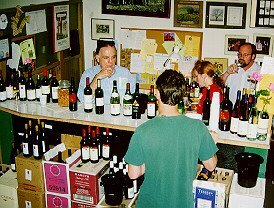 What I love about Chronicle Wine Cellar (other than the wine) is that they have about half a dozen people working there (singly or in pairs, usually) and no matter who is in the store, they are friendly, informed, and honest. I'm so sick of going into wine stores and asking questions only to have them make stuff up. Today I asked Bob, who was on his own this morning, if he'd had the wine I was about to buy and he said no without hesitation. He also recommended a wine I knew nothing about, but he said the buzz on it in the shop was good. They have great shelf-talkers, which are a combination of published wine reviews and staff wine reviews. I trust their staff reviews completely--if they say its a good value wine, I buy it without worrying about being taken in (see honesty, above). Chronicle Wine Cellar is a bit like Odd Bins used to be in the UK when it was just a few tiny shops with lots of small quantities of wine that you never saw anywhere else. Chronicle Wines has a particularly nice selection of French wine, along with a great US pinot noir section and some fine cabernets and chardonnay. Today, they had some new arrivals: Pierre-Marie Chermette's high-end 2005 Fleurie Les Garants ($16.95), 2004 Chateau de La Preuille Muscadet Sur Lie Tete de Cuvee ($13.95), and 2004 La Craie Vouvray ($7.95). So I picked those up to fill in some of those impending vacancies on the old wine rack and went home to clean the house! My partner is at a conference up north and I'm on my own tonight so I get to make whatever I want for dinner and drink something fun, fizzy, and not so alcoholic that I'm going to be asleep by 7:30. The answer came to me from JohnG's blog, quaffability. (I nicked this picture from his blog--thanks, JohnG.) JohnG's site specializes in wine that's mostly from Trader Joe's and mostly under $12. As he says on the site, "we taste it so you don't have to." Check it out! The 2005 Contadino Pinot Grigio Frizzante is fun to drink and available in my area at Trader Joe's for a staggeringly low $3.99. Even though it was frizzante, it had strong varietal characteristics of Pinot Grigio. Given these characteristics, and its unbelievably low price, I'm going to say this is excellent QPR. I certainly wasn' t expecting much going in. Most wines that are this inexpensive have no varietal characteristics whatsoever--you know, the chardonnays that taste like microwaved popcorn and the merlots that taste like some indefinable Red Fruit. The packaging didn't help. Why put a wrap on a screwcap, for God's sake? It was really chilled down, so I let it sit in the glass for just a bit while I started dinner. Its tiny bubbles and lightly sparkling texture was evident. Frizzante on the label was, lets face it, a bit alarming when I saw it in the store, conjuring up horrible memories of nasty spumante. But spumante is BIG bubbles while frizzante is technically "semi-sparkling" and, more to the point, small bubbles. I took a few sips while I was getting another Jamie Oliver roasted fennel dish ready to pop in the oven and marinating the lemon-thyme chicken. It was very pale in the glass, and the aromas were subtle and appley. The flavors were stronger apple, with a hint of lemon blossom (more an impression than a strong citrusy flavor, which you get with most pinot grigio). It was perfectly easy (too easy?) to drink without food. With food, it was even better, holding up well to the salty olives and anise flavors of the fennel, and to the herbs and lemon on the chicken. This wine is not sweet, and it is not "bubbly." It is very easy to drink, however. Buy a few bottles for the last picnic of the season, or to have at cocktails this weekend, or even to sip while the kids carve pumpkins for Halloween. Another recent purchase from Chronicle Wine Cellar in Pasadena was this 2005 Matua Valley Sauvignon Blanc for $7.95. This is very widely available through internet outlets, and I've seen it in some area supermarkets, too. I popped this in the fridge in the late afternoon to chill a bit, then had a glass while dinner was finishing up in the oven. Tonight we're having a Jamie Oliver pot-roasted chicken with sweet and sour sauce from his Happy Days with the Naked Chef. The recipe is not online, but it would be a great dish for entertaining since you just chop things up, throw them in the oven for 1.5 hours and then plate it and whizz up the sauce in the food processor from the veggies that have roasted under the chicken. Matua is New Zealand winery that produces a full range of wines. I find that New Zealand Sauvignon Blancs are a bit more restrained and subtle than the lush, tropical Australian Sauvignon Blancs. While I love them both, I decided I wanted something that would compliment, rather than compete with, the ginger and strong flavors in the main dish we are having tonight. Like most sauvignon blancs, the 2005 Matua is light, flavorful, and tangy. It is a pale lemon color. When you first smell it, the overwhelming impression is one of fresh cut grass. There is nothing aggressive or green-peppery in the aromas. You may catch a whiff of lime or citrus. When you taste it, the taste impression is also herbal, with a bit of lime on the end. This wine has 13.5% alch/vol. and has none of the vanilla or oak flavors associated with ageing in oak. I think this wine has a very good Quality/Price Ratio (QPR) at $7.95. This would be a good compromise wine for those who find French sauvignon blanc hard to find, but are not always happy with the lush, fruity Australian sauvignon blancs. There is none of the mineral taste you find in a good French sauvignon blanc here, but it is still delicious. I purchased this wine about 10 days ago at Chronicle Wine Cellar in Pasadena, CA for $10.95. They are a great source for excellent wine buys in the LA area with unusual selections not found in supermarkets and a knowledgeable and helpful staff. They have an email list that you can subscribe to for cellar updates. To give you some sense of what the label looks like, I borrowed this from the 2004 vintage. The Chermette Beaujolais is also available online through wine merchants (find them by checking on Wine-Searcher). This is a gamay wine, not as light and fruity as the better-known beaujolais nouveau but still not a heavily-oaked Napa cabernet sauvignon, either. It is a simple, fruit forward wine that ideally should have a silkiness of texture and low alcohol, making it easy to pair with a variety of food choices. This is a pleasant 12% alc/vol. 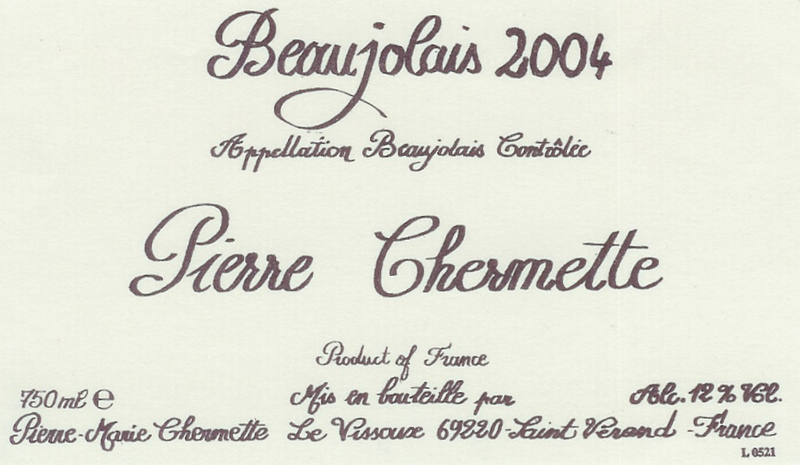 You can read more about Pierre Chermette and his vineyards by clicking here. When I opened and poured out the first glass, it was ruby in color, with purple edges. The aromas were of cassis, raspberry, and a whiff of alcohol. When you tasted it it was full of black and red raspberrys and was slightly spicy. The wine had a surprisingly nice finish for a light red wine. I had a glass while dinner was cooking, and because of the alcohol aromas (and because it was about 75 in the kitchen today, not cellar temp! ), decided to pop it in the fridge for about 15 minutes to see how chilling it slightly worked for the wine. Beaujolais wines are excellent summer reds and bbq wines because they are often best slightly chilled. Dinner tonight was herb roasted pork--an ideal match for the beaujolais. With it we had honey-roasted sweet potatoes and a great Jamie Oliver salad with peaches, prosciutto and mozzarella. The wine was a nice counterpoint to the herbs and garlic on the pork--rich without being too acidic or tannic. It helped to pick up a slightly herbal note in the wine. And the chilling did help with the alcohol. Overall, this wine has excellent QPR and would make a food-friendly choice for grilled meat, bbq, and pasta dishes. Tasting notes and impressions will be available soon!